My most recent addition to djdiamonddog.com is a mashup which was requested by my good friend (& graphic designer) Danny from danielmoya.com . 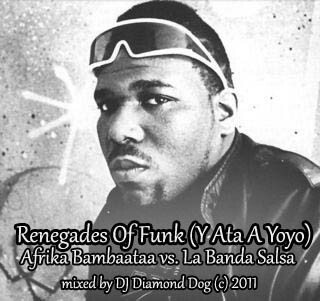 This new track fuses Afrika Bambaataa's Renegades Of Funk & La Banda Salsa' Y Ata A Yoyo. With some additional heavy percussion & an old school breakdown (featuring a sample of the 1978 Miami hit from Herman Kelly & Life ... Dance To The Drummer's Beat, this one brings the past into the present with full force. So if you enjoy old school hip hop, funk, and/or electro, then this mashup will surely be an enjoyable one for you!! I appreciate everyone's support. Remember, if you have any ideas or suggestions for me, please do not hesitate to hit me up at hitmeup@djdiamonddog.com .